Dede Boies began her career in agriculture because of a fierce love of animals, and a belief that animals deserve to live their best lives in return for nourishing us as food. 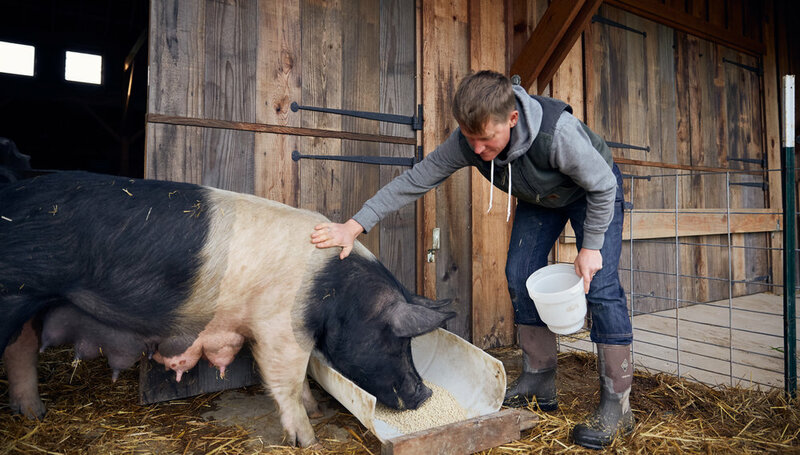 Now she runs Root Down Farm, a farm located on 62-acres in beautiful, coastal Pescadero that raises pastured pigs and poultry with a focus on holistic practices that promote the health of both animal and soil. In honor of Mother’s Day, we are celebrating new mom Dede, and her vision for a world in which baby Eddy and you, her community, connect with the animals you eat. 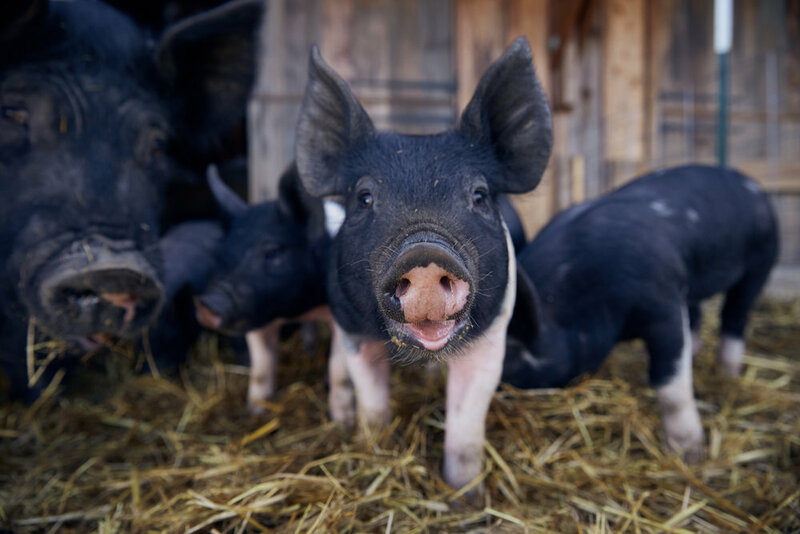 A world in which animals live happy and healthy lives. We hope you will consider making a donation today to Kitchen Table Advisors, and join us in fueling not only the the farms and ranches in our program, but the families they sustain. 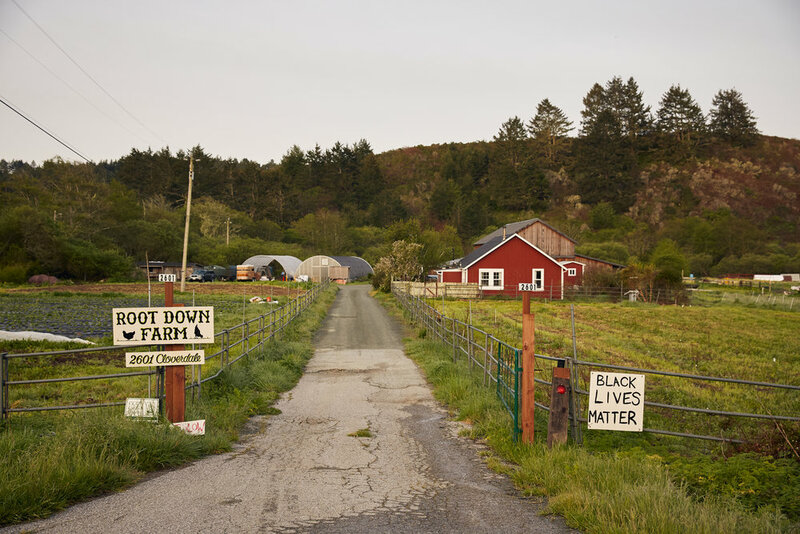 Dawn breaks over Root Down Farm, a 62 acre slice of agricultural heaven in Pescadero, the heart of California's Central Coast. Owner Dede Boies leases from Peninsula Open Space Trust (POST), an organization that protects and cares for open space, farms and parkland in and around Silicon Valley. Dede Boies wakes early to begin the work of caring for her animals. 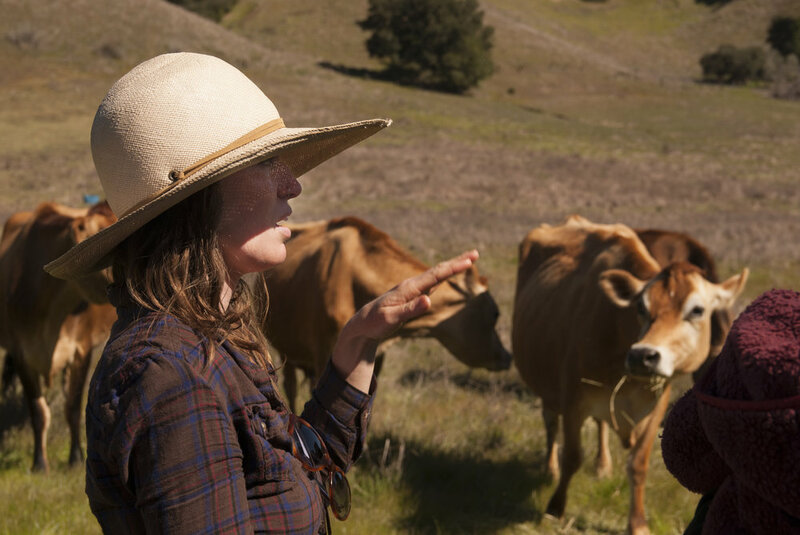 She started the farm five years ago with the goal of raising the healthiest animals possible, while working within her ecosystem to responsibly steward the land and improve soil health. Dede squeezes in a cuddle with farm dog Oaty before putting on her boots and heading out onto the farm. Her love of animals shapes Root Down Farm's mission to invest in the health and happiness of her flocks. Root Down Farm's chickens, ducks, turkeys and pigs spend their days running and rooting around the farm, feasting on bugs, grubs & grass. Their diets are supplemented with organic vegetables, apples and non-GMO grain each morning. Root Down Farm's sow, Betty, eagerly eats a breakfast of grains, after having given birth to piglets just one week before. Root Down Farm is bursting with new life this spring, including Dede's own newborn daughter, Eddy. Dede has often heard that meat eaters couldn't possibly love animals. The way she sees it, though, is that her work honors her animals' lives and their nourishment of families like her own. "They live the best life possible before we get to eat them." 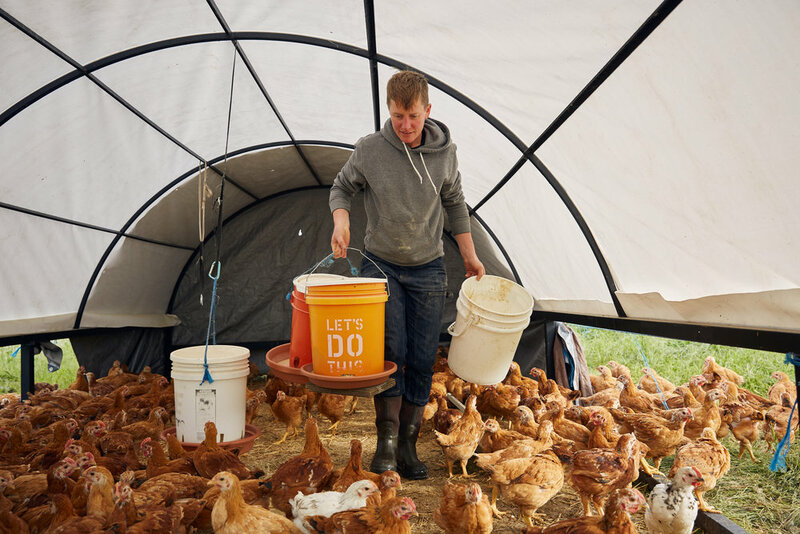 Root Down Farm grows and markets their own Delaware (heritage) and Red Ranger (hybrid) chickens, "old" breeds of poultry that grow at slow, healthy rates, reproduce naturally, thrive being active outside and, as a result, have better flavor. Everyday is an adventure with a newborn. Dede and her wife Melissa are constantly learning how to balance farm demands with a growing family. They make a schedule each day with the knowledge that it's a constant evolution. After taking care of farm tasks, Dede takes three-month old Eddy for a walk around the property to give Melissa a break from baby duty. She is thrilled to raise a child in this environment: surrounded by nature, eventually playing with the animals and (hopefully) getting dirty. Another benefit of raising a child on a farm, and within a community passionate about food: Eddy will grow up eating very well. Dede dedicates her life to raising animals that nourish other families. Now that she has her own child, eaters that invest in her small farm can in turn support Dede and Melissa in nourishing Eddy with good food. Melissa bounces Eddy while Dede takes an order. While Melissa isn't directly involved in Root Down Farm, she is Dede's biggest champion and supporter. Being a sole business owner can often be isolating, and sometimes it helps to have a thought partner outside the family. Another source of support is Kitchen Table Advisors. As Dede holds a sleeping Eddy, she and Farm Business Advisor Sarah Gearen review Root Down Farm's growth over the last year. "We are respected, valued and supported by our greater community." Post-Its scrawled with Root down farm's values are a source of daily inspiration. Over the last couple years, Dede has learned to identify core values and where ideals need to be evaluated to support running a sustainable business. After a long day of farm work, caring for a newborn and managing the operations of a small business, Dede, Melissa and Dede's father, Ed, relax in their living room for some cherished time with Eddy. Donate today to continue building a food community where family farms can thrive. We have so much to celebrate in 2018- not just in what the organization has accomplished in five years, but by how the organization has grown, and strengthened and flexed. I’ve decided to share a few words in the form of a recipe-- in part because we’re all here bound together by farming and therefore food, in part because Kitchen Table Advisors is still something we are adding to, changing, seasoning, and transforming, much like a shared meal. Serves an entire community of farmers, volunteers, business owners, funders, leaders, and families. First, set the dial to 2013. Next, bring Anthony, Pei-Yee, and Paige into the mix. Combine with a heaping cup of humility, drive, vision, and hard work. Make sure there is no central office and that work-life balance is at the center of everything. Mix in to the organization’s culture: a love for food, games, entrepreneurship, and a true passion for elevating farmers and ranchers. Foster inclusion, support, and trust. Push against organizational hierarchy, support shared leadership and a common vision. Infuse with the wisdom and guidance of a zillion leaders, role models, elders, mentors, and teachers. Sprinkle with the foresight of individuals whose influential roles have transcended the institutions in which they’ve worked like Tony Moraga, Sallie Calhoun, Esther Park, Cynthia Wong, Michael Roberts, and many, many, many others. Whisk together good ideas, early funding, true collaboration and thoughtfulness. Look to organizations like California FarmLink, ALBA, CUESA, RSF Social Finance and others, and learn from them. Get businesses on your side like Coke Farm, FEED Sonoma, Veritable Vegetable, Bi-Rite , Straus Family Creamery, and Clif Bar. Add dashes and pinches of ideas from other shoulders on which you stand: Swanton Berry Farm, Morris Grassfed, The Perennial, CalCan, MALT, and the Farmer Justice Collaborative. Finally, blend in financial assistance from funders and supporters, like New Priorities Foundation, Bank of the West , the 11th Hour Project, and Gaia Fund. Don’t forget the individuals (many of whom are here today) that made meaningful gifts to KTA through the years. Reduce the mission to a clear, digestible statement: to support the economic viability of farmers and ranchers. Form your one on one business advising program. Scramble together with your first cohort of farmers. After 2 years, bring on David Mancera, and then Thomas Nelson as farm business advisors. Expand your programs to include more farmers. Add tablespoons of hard work, pounds of networking, and gallons of hustle. Keep stirring the pot. Turn the dial to 2017. Add Daniella Sawaya to engage community through powerful storytelling, and then fold in Sarah Gearen and Deb Nares as farm business advisors, and Noelle Fogg-Elibol, to nurture our growing community of partners. Let them marinate. Let the organization rest in knowing that each cycle of growth brought the right people with the right skills, talents and experience to build a better, stronger organization. Shape your board, pepper them with questions and strategic implementation, let them rise. Mound in the center the knowledge that you successfully completed your pilot, and are able to see the tangible benefit of your work in the lives of your clients. Add yet another cohort of farmers, bringing your services to 50 clients. Layer with a strong theory of change, even more of a focus on diversity and inclusion, and an ever-strengthening values proposition. Place the organization in a broader context, draw your community together, deepen your relationships. Always have a north star, one that says farmers & ranchers are thriving leaders of a vibrant, community-based economy rooted in equitable distribution of power & resources. Treat people fairly, support your community and let them support you. Focus on getting good at what you are trying to achieve, stay nimble. Value the uniqueness of everyone and embrace the racial, gender, socioeconomic and cultural diversity of the local food system. Maintain a sense of humor, remain thankful. Invite two alumni farmer clients to join your board. Relish the cyclical nature of giving and giving back. Chill enough to take the time to celebrate. Serve to your community on a farm on a sunny day in February with a side of good food and ice cream sandwiches. Enjoy with friends, colleagues, strangers, and family. Happy Birthday Kitchen Table Advisors! This recipe was presented by Kitchen Cabinet member, Nicole Mason, during Kitchen Table Advisors' 5th Anniversary Celebration at Green Valley Farm + Mill. It is shared here alongside photos courtesy of Sarah Trent. As we reflect on Kitchen Table Advisors’ 5-year anniversary this January 2018, we have been inspired to appreciate and give respect to the people, businesses and organizations that we stand on the shoulders of in fueling the economic viability of sustainable small farms and ranches. Our piece of the puzzle - helping a diversity of farmers and ranchers more equitably access the business tools, resources and support they need - builds on the hard work and legacy of hundreds before us. Our work would not be meaningful without the struggles and achievements of pioneering farmers and ranchers, organic produce distributors, natural food grocery stores, chefs and restaurants honoring farmers, farmers markets, farm incubators, technical assistance providers, policy and advocacy groups, philanthropists and foundations, and more. Our focus on the economic viability of the next generation of sustainable farmers and ranchers only matters in the greater context of a healthy ecosystem that supports land, markets, financing, regulations and ecological farming practices for farmers and ranchers. 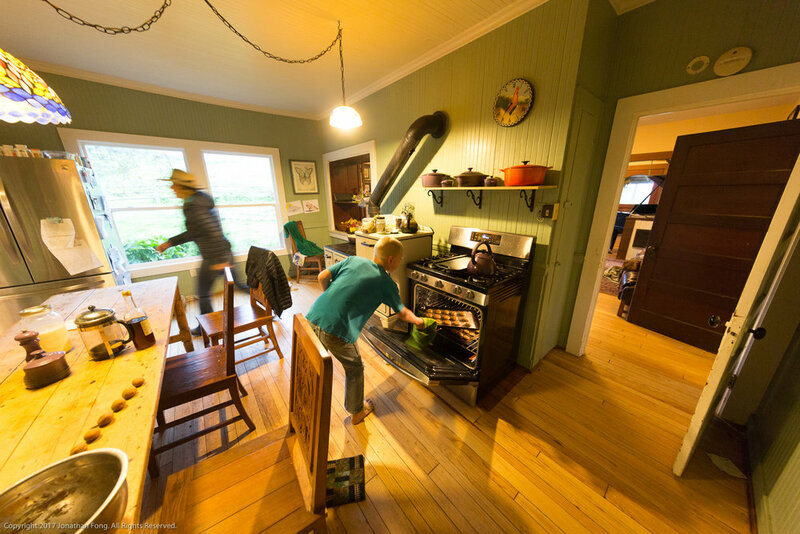 Kitchen Table Advisors was originally conceived to build upon the important work that many before us have done for decades; to add another piece of the puzzle that complemented the work of others; to join the fight and hopefully make our regional sustainable food and ag ecosystem. As we reflect on our ecosystem and a bigger picture collective vision for a more equitable, resilient and healthy regional food economy, we are so grateful to know that we are all in this fight together, and that we all have an important role to play, individually and as part of the collective. We know there are many challenges ahead of us - including racial equity and representation in the movement, the need for stronger pipelines of talent into the field, the need for additional financial resources to do the work. And, we are so grateful for the work done before us; for the shoulders that Kitchen Table Advisors stands upon; for your partnership in this journey; for the opportunity to join this fight 5 years ago and to continue pooling our people, financial and social capital for the collective fight for years to come. 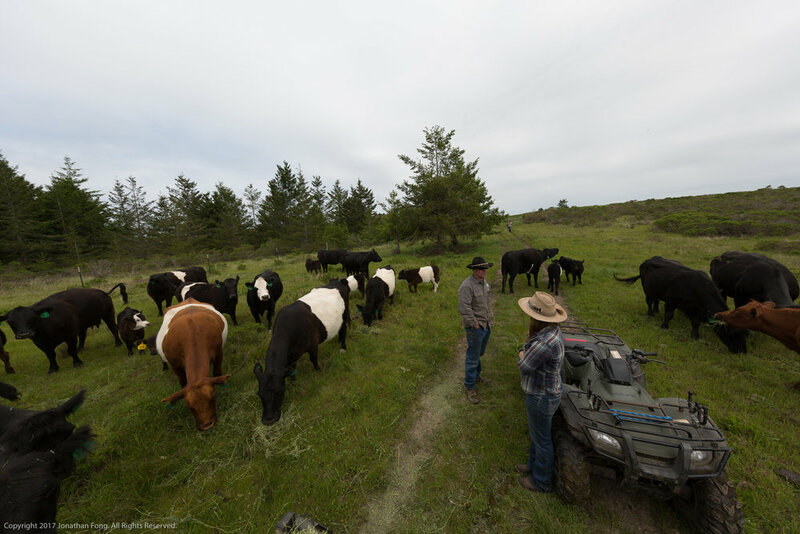 The Markegards are a multi-generational ranching family pioneering regenerative practices and the force behind Markegard Family Grass-Fed. 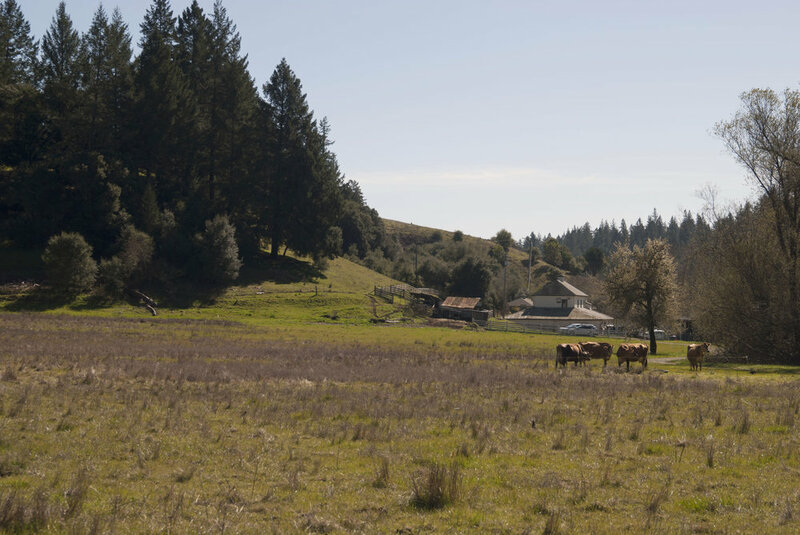 The Markegards steward over 8000 acres of land across the Bay Area, including the breathtaking ranch where they live in Pescadero, CA. Doniga and Erik, and their children, Leah, Larry, Quince and Quill raise healthy livestock and steward the land so our own families can eat well and future generations can live in a healthier world. Doniga begins her day by packing raw cow’s milk for their CSA deliveries. CSA, or Community Supported Agriculture, is a powerful connection between a farmer and their customers. It not only supports the Markegard’s business, but also enables them to share a high quality product with the community and nurture families like theirs. Like many entrepreneurs, Doniga balances a variety of roles on a daily basis: rancher, mother, wife, author, business owner. This morning she takes a break from farm duties to help their son Larry prepare baked goods that he and his siblings will sell at an event on the ranch later in the day. It turns out a the passion for feeding people, and an entrepreneurial spirit, runs in the family! The Markegards run a diverse operation, supplementing their grass-fed cattle with milk cows, grassfed lamb, chickens and pigs. This diversity is key to achieving business viability and success, as are team members, like Sue here, who support Doniga and Erik with operations on the ranch. Each of Doniga and Erik’s four children has their own passions and interests. “The thing we want for them is a really positive experience with this lifestyle where they love doing it and are passionate about it. If they aren’t, they need to go find something they are passionate about.” Their oldest, Leah and Larry, are already involved in the family business, and Larry has even begun raising his own hogs for 4-H. When the Erik and Doniga started growing their family, their options were either that Doniga find an off-farm job or they figure out a viable way for them both to work on the farm. Their decision to opt for the latter has created a special opportunity where the values they hold dear are intimately woven into their family business. 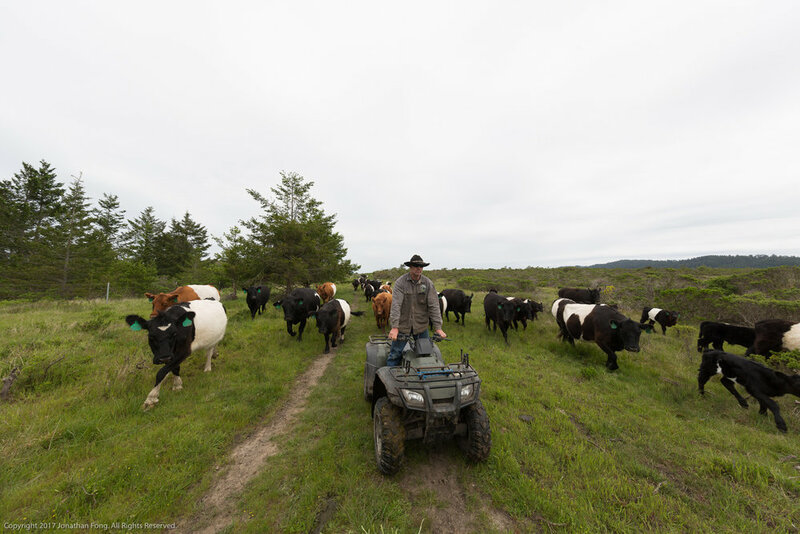 Erik wrangles half of their herd, guiding them to a new pasture as they rotate their cattle. When Erik and Doniga further expanded upon his family’s traditional ranching practices, another aspect of the transition included a greater use of technology. Because of the size of their property and herds, the Markegards work their cattle with the help of UTVs and ATVs. Approaching from another direction, Doniga, their youngest, Quill and Quince, and a farm dog wrangle the other half of their herd. Quill and Quince know that their mom is out working, and if they want to spend time with her they can join her for a cruise on the UTV, or get on the horses to move cattle. Like older siblings Leah and Larry, they’re discovering their passions within the family business and the ways they most connect to the land. An accidental introduction and a shared interest in the localized ecosystem brought Doniga and Erik together. They became friends, tracking mountain lions together, and as they grew close she learned more about ranching. Doniga’s wildlife tracking and permaculture background aligned well with how Erik and his family were already ranching. This month Doniga will add author to her extensive resume with her forthcoming memoir, Dawn Again, Tracking the Wisdom of the Wild. We cannot wait to dig into what promises to be an engrossing read from an inspiring and strong woman that our team deeply admires. As the day winds down, Doniga shares a quiet stroll back to their home with Quill and Quince. Theirs is a full life -- full of hard work, full of care for the land, and full of love for one another. The Markegard’s decisions to incorporate regenerative practices into their business and to introduce their children to stems from their shared respect for the animals both under their stewardship and those within the greater ecosystem. On February 28, 2017, 300+ people gathered at UC Davis for the annual CalCAN (California Climate and Agriculture Network) conference. Farmers and ranchers, government and non-profit agencies, policy advocates and funders came together to learn, share best practices, and problem solve around agriculture and climate change. I had never been to the CalCAN Summit before, but left feeling blown away by the quality of people and conversation. I clearly sensed the deep intersection of our work supporting the economic viability of sustainable small farms and ranches with CalCAN’s coalition and policy work supporting ecological land stewardship and climate resilience on farms. Several of the farms we support at Kitchen Table Advisors had a presence at the conference: Javier Zamora of JSM Organics was on a farmer panel in the opening plenary; Emma Torbert of Cloverleaf Farm participated in a workshop; and Alexis and Gilles Robertson of Skyelark Ranch hosted a farm tour. It was great to be in dialogue with seasoned farmers like Judith Redmond of Full Belly Farm and Albert Straus of Straus Family Creamery; non-profit partners like POST, California FarmLink, Point Blue, and the Carbon Cycle Institute; thoughtful policy advocates like Renata Brillinger at CalCAN and Dave Runsten at CAFF; and key supporters like Sallie Calhoun of Paicines Ranch, Michael Roberts and Joanna Lehrman at 11th Hour Project, Susan Clark at Gaia Fund, and Nancy Schaub of New Priorities Foundation. The day after the CalCAN Summit, 70+ people spent the day visiting three farms in the Capay Valley to walk the land, touch and feel the soil, and hear from farmers on the ground about healthy soils, agriculture and climate change, and how they understand the connection between operating an economically successful farm while stewarding the land. The first stop was at Yocha Dehe Wintun Nation Farm & Ranch, owned and operated by the Wintun Nation tribe, to hear from ranch manager Adam Cline about his efforts to raise cattle while improving soil and ecosystem health. Co-leading the tour was Corey Shake, a partner biologist with Point Blue who is part of a statewide rangeland monitoring network providing advice and conducting wildlife and plant species monitoring to learn about the impacts of grazing strategies on soil health. The group moved on to Full Belly Farm to enjoy a delicious organic lunch prepared on farm with their fresh organic ingredients. Co-owners Judith Redmond and Paul Muller shared their experiments and experiences with minimizing soil disturbance, using various cover crop mixes, and rotating livestock to enhance soil organic matter and carbon sequestration. 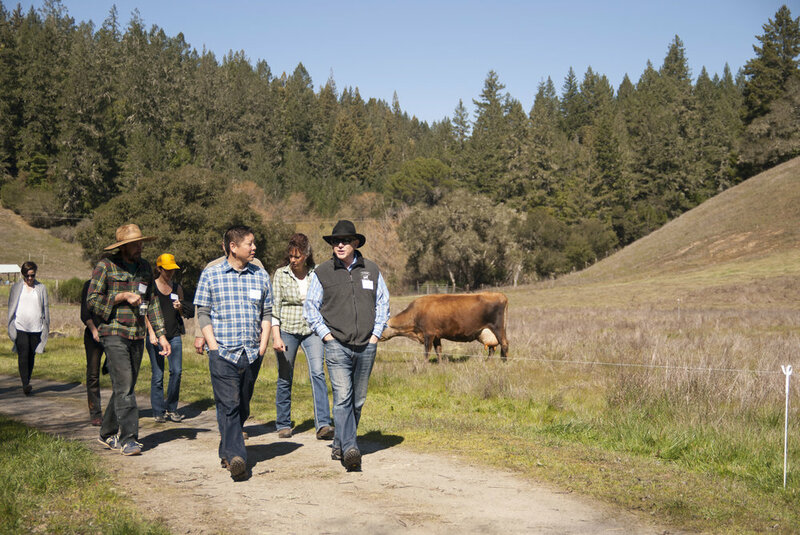 The last stop on the farm tour was with Kitchen Table Advisors client Skyelark Ranch, a 40-acre pastured livestock ranch operated by Alexis and Gillies Robertson who receive business advising from our Farm Business Advisor based in Yolo County, Thomas Nelson. Alexis and Gilles are a young couple who have been farming since 2010. They sell their pastured lamb and pork through the Davis and Oakland Jack London Square farmers’ markets, and their pastured eggs to institutions like Airbnb through food hubs like the Capay Valley Farm Shop. We walked under the canopy of an old almond orchard where Alexis and Gillies rotate pigs and chickens next to fields where they grow hay and graze their sheep. The focus of the conversation was, of course, around how they manage the animals and their land, and how the land stewardship practices of farms like theirs are helping fight climate change. After we walked under blue skies to the top of the hill that overlooks their farm, Alexis and Gillies reminded us that this conversation about their efforts to steward the land, sequester carbon, and battle climate change has to be considered in the context of the long-term viability of their farm business and their ability to make enough to support their family. They have a one-year-old daughter, Isla. 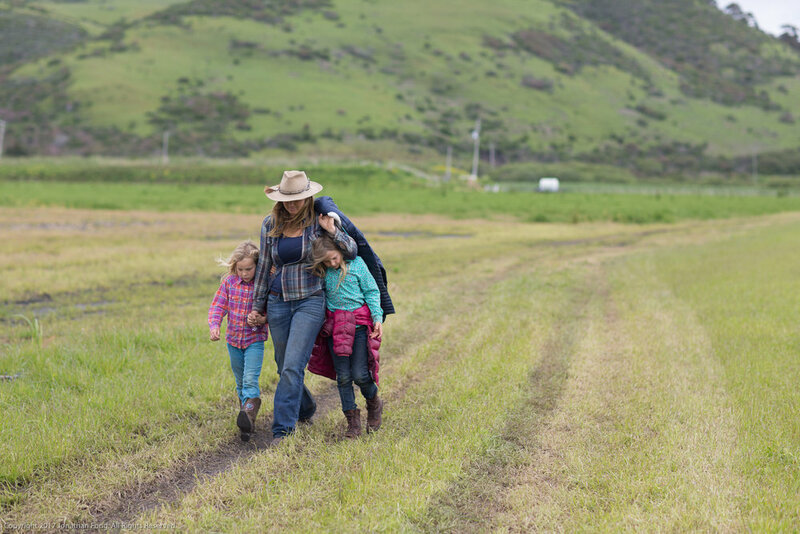 The family has been working hard and fighting an uphill battle to build Skyelark Ranch to be a farm business that raises livestock in a humane way that is in balance with the land and their community, and provides a living for their young family. It’s more than clear to Alexis and Gillies that they need to have a farm that is economically viable in order to be sustainable. They need to be able to cover business expenses and investments in long-term farm infrastructure; cover their family’s living expenses; and hopefully have the chance to eventually save a little money. Because if they can’t do that, then despite their best intentions, they will not be able to continue stewarding the land in a way that is in line with their values, incorporating practices that sequester carbon, and building healthy soils. As the sun was getting low in the sky, we closed our conversation surrounded by sheep in one of their pastures. We talked about how long-term farm viability is a necessary piece of the puzzle to nurturing ecological farm land stewardship, and how farmers like Alexis and Gillies need to focus on running their farm as a business AND build a network of support. It became apparent that all of us gathered together at the CalCAN Summit, standing in a circle around Alexis and Gillies in their pasture, were part of that network: seasoned farmers who provide advice and support; groups like the Capay Valley Farm Shop and Fibershed that market, aggregate, and distribute their product; non-profits like Kitchen Table Advisors and California FarmLink that provide business advising and financing; and organizations like CalCAN that advocate for policy solutions that create an environment in which farms like Skyelark Ranch can thrive. And we each rambled off into the lazy sun of the afternoon to go back to where we came from to play our part in this ecosystem. In 2016, Bertha Magaña of Magaña Farm in Watsonville lost roughly 14,400 pounds of strawberries. The loss wasn’t due to pests or weather woes. It was due to a lack of manpower--a challenge many Kitchen Table Advisors clients and farmers across the nation are facing. For Magaña, no labor to help harvest one acre of strawberries for three consecutive months meant missing out on some $16,000 in profit. Magaña is not alone. The lack of labor has forced many farmers across the country to cut back production or even sell portions of their land. The reality is that many of the roles undocumented immigrants fill would otherwise go unfilled. As reported by the Wall Street Journal, small business owners say that U.S.-born workers don’t want the jobs these immigrants are taking on. There is a serious labor shortage across the nation, and it’s hitting agriculture especially hard. The American Farm Bureau Federation estimates that 70% of all field workers are undocumented. What’s behind the shortage? Mancera notes a number of factors, including stricter immigration laws, an increasingly costly — and dangerous — border crossing, new economic drivers to stay in Mexico, and increasing work options in industries with easier, safer conditions like hospitality and landscaping. The result of this shortage is unharvested crops and even forfeited land. According to a report by the Partnership for a New American Economy, a nonpartisan group that aims to influence immigration reform, the labor decline has reduced produce and tree nut production by $3.1 billion per year. The group reports that in California, the number of full-time equivalent field and crop workers declined by about 85,000 people between 2002 and 2014. With a commitment to sustainability, many of the Kitchen Table Advisors farmers find themselves in a particularly difficult position owing to the fact that their farm operations are labor-intensive. Non-mechanized harvests and avoidance of pesticides mean that small farmers are more reliant on individuals to support their production. Rising wages across industries and a shrinking pool of farm workers makes it increasingly challenging for small farm owners to reach economic viability. Mancera notes that raising wages isn’t a viable option for most farmers due to economic constraints. At the same time, for many laborers, higher wages aren’t the ultimate goal as they don’t want to lose benefits like childcare services. Another common approach Mancera sees is farmers looking to relatives and the community. Social gatherings, be it Sunday church or soccer, become a way to find help. Because the people in these networks of friends, family, and neighbors typically have day jobs, they’ll go to the farm in the evening to help harvest. Payment varies from cash to vegetables or even a big group dinner. Looking ahead, Mancera sees the financial advising that Kitchen Table Advisors offers as being more vital than ever. By providing his clients with a deeper understanding of their finances, Mancera hopes to help them make more informed, empowered business decisions. He is also eager to support them in utilizing the federal H2-A visa program which provides temporary visas for foreigners who’ve secured seasonal agriculture work. He’s hopeful that if the dialogue around food and its growers was ongoing and alive at every dinner table, things would start to shift. He muses that perhaps curious teens — aware that their food comes from the Salinas Valley, not just the grocery store — would even consider harvesting produce as a summer job. Photos courtesy of Blue House Farm. In 2013, we began advising 10 sustainable small farms. In 2016, these original 10 farms graduated into our alumni program, while we simultaneously began a three-year journey with 15 new farms and ranches. And now at the end of this year, we are welcoming an incoming group of 14 new clients, tripling the number of small farms and ranches served since our inception. By assessing our program impact from the pilot project, we have been able to refine our program model and expand our services to a greater number of farms and ranches in the region. With greater reach, we are introducing new metrics to assess our clients' impact on soil health, food access, and social justice. Not to mention, we're also planting our stake in the ground to represent our support for diversity in the leadership of our food system, specifically among Latinos, women, and LGBTQ farmers. We are in a wonderful place right now--similar, yet different to the place many of our new clients are in when they join our organization. Kitchen Table Advisors will be turning four years old this January 2017–-having just passed the starting line for our three-year pilot project--and now scaling up in Phase 2 of our growth. This is an exciting time, with the challenge of ramping up while staying thoughtful and true to our core values and priorities. We are also setting the foundation for a humming organization--through planning for our current and future clients and improving systems for our team to have better efficiency without losing the personalized relationships that have proven to be the secret sauce of our work. Our team is changing and growing, which only means one thing: we are creating a better organization--collaborating on the best of our collective ideas, inspirations, and perspectives. During our New Client Gathering in November, we had the pleasure of bringing (almost) all of our new clients together to get acquainted, and ask questions, and harness the energy of the group. This cohort was game from the start, jumping in immediately and sharing challenges that they are facing right now and their overall visions for their farms. Farmers spoke about wanting to create a meaningful workplace for their employees--a place where their employees are happy to go everyday and find fulfillment in their contribution. We heard themes surrounding access to land, markets, and capital--these are many of the same challenges that young farmers face. In addition, there are the ever present challenges that are completely out of a farmer's control: weather, water, time, technology. Our new cohort of clients are asking themselves big questions as well as finding themselves at inflection points that we are excited to support. One set of new clients is a budding partnership where two farm owners are bringing on two new partners. They are thrilled for the expansion of their farm family, and are committed to supporting everyone and clarifying a common vision. Another client is currently determining the best legal structure for his business entity as well as preparing his business to hire employees. For all of our clients, deciding the right path forward for their enterprise comes at a time when the landscape of how business is done in our country is changing. With already extreme labor shortages in the farm sector, the outlook for the future is unknown. Additionally, proposed changes to Agricultural Labor Laws are coming down the pipeline and the cost of land in the Bay Area continues to rise steadily. One piece of what we do through our advising program is to help our farmers understand and manage risk. Some of that comes with planning for known risks, and some is creating resilience in their surroundings (labor pool, vendor relationships, lenders) that will sustain them through the unanticipated storms. Sometimes, simply creating the space and practicing looking up from the daily work toward what's ahead is enough to help our clients plan for success. In the midst of these challenges, our new clients are also extremely well-poised for this success. There is a network of support available to them--food hubs like like Coke Farm, FEED Sonoma, Capay Valley Farm Shop, and Veritable Vegetable--that champion their farm treasures and stories. There is also a growing number of corporate food service companies offering healthy local farm to table food. From amazing chefs at celebrated restaurants to retailers who highlight farm sourcing to destination farmers markets, the local farming community is cherished and lauded by many folks in and around the Bay Area. Our new and existing farmers will need all sorts of support to change the tide towards resilient and diverse farming communities, because everyone who eats is a part of the story. Continue voting with your fork! Purchase directly from your farmer: through a CSA, an animal share, from a trusted restaurant or retailer that sources from local farmers. Share with your neighbors and your kids about why local food and transparent sourcing is important to you. 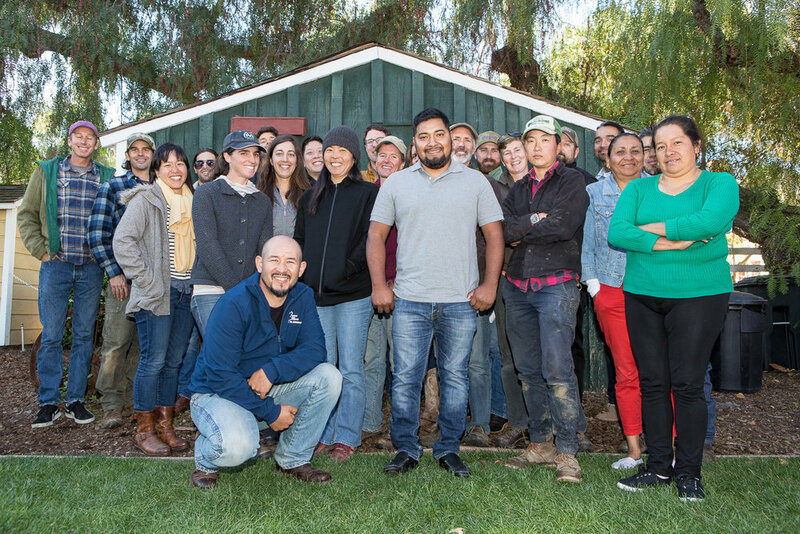 Support our incredible local network of organizations who work daily to create opportunities for triple bottom line farmers--ALBA, California Farmlink, POST, and CUESA. Most importantly, get to know your farmers and be a champion of your local farm scene. Without further ado, here is our wonderful new cohort of clients! And don't forget to check out our 2016 cohort and alumni, as well! Photos courtesy of Jeff Spirer. An hour from Silicon Valley, the small town of Hollister feels a world away. Marsha and Modesto, farmers and co-owners of Oya Organics, live and work in Hollister, where they raise their young family and build their small business. Oya Organics is an 18-acre organic vegetable farm on Las Viboras Road that produces healthy food and creates employment opportunities in a town that desperately needs them. After three years of investing blood, sweat, and tears into her business, Marsha has a lot to be proud of. Cristoforo emigrated from Oaxaca, Mexico to the U.S., where he was given the opportunity to work alongside his nephew Modesto, the co-owner of Oya Organics. He proudly displays a vine of fava beans that are ripe for harvest. Cristoforo settles into his work during an early spring morning in Hollister, California. Located about an hour south of the world’s technology mecca, Silicon Valley, Hollister is a sleepy, slow-moving town whose local economy and labor force is powered primarily by agriculture. 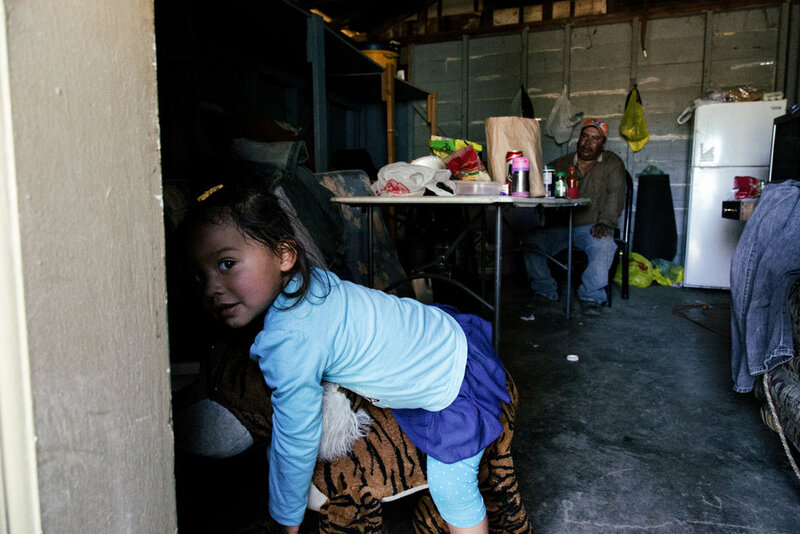 Saori, the three-year-old daughter of Oya owners Marsha and Modesto, races up the stairs of her two-story house. Although Hollister is considered to be a part of San Francisco’s greater Bay Area, the economic context is far different from how most perceive the region. For example, the median home value in Hollister is $471,700, compared to $712,000 in the Bay Area. Marsha, Saori’s mother, takes a break from her administrative duties and house work to chase her daughter around the house. The mother-daughter dynamic they share is beautifully unique. Marsha’s stoic exterior is counterbalanced by Saori’s outspokenness and relentless pace. 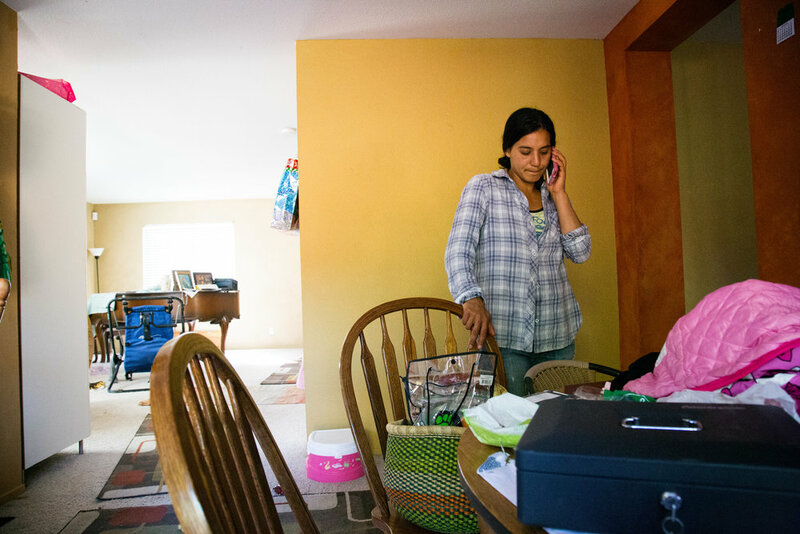 Marsha, the owner of Oya Organics, takes an order over the phone right after preparing breakfast for her daughter, Saori. With a small business to run, a messy home, and a young child to care for, you'd assume Marsha would be in a constant struggle to maintain sanity. Yet her calm nature keeps her feet planted and her head clear. After a quick stop at the irrigation store, Marsha picks up lunch for her and her fellow Oya farmers, while Saori gazes longingly into the store’s baked goods case. Back at the farm for lunch, Saori makes a mad dash towards her uncle Cristoforo's room which doubles as a break room for the farmers. His room is host to empty beer cans, farming tools, a mattress and a stuffed tiger that Saori used as her very own horse. The farm’s de facto elder and primary tractor operator Alfredo, smiles brightly as he prepares for hours of driving in the field. Marsha waters her plants in the greenhouse as the afternoon begins to settle over the farm. 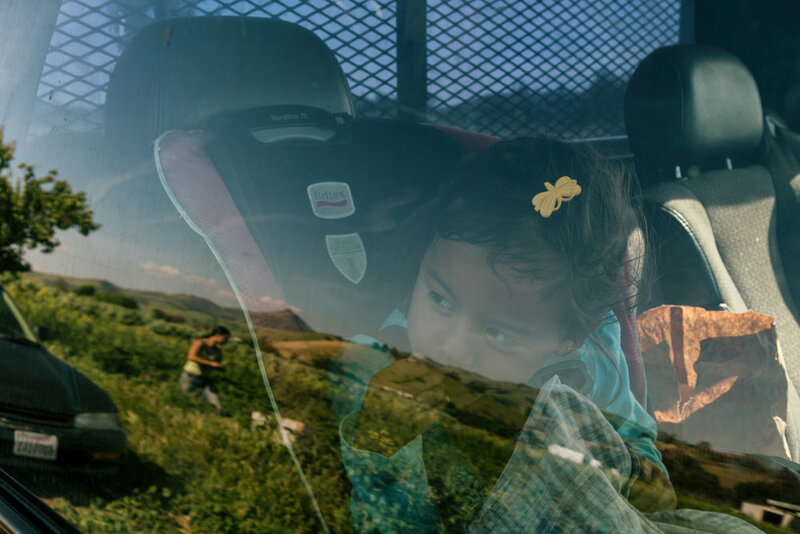 Saori watches her mother harvest crops out of the window of a pickup truck. It’s evident that she keenly admires her mother's strength.